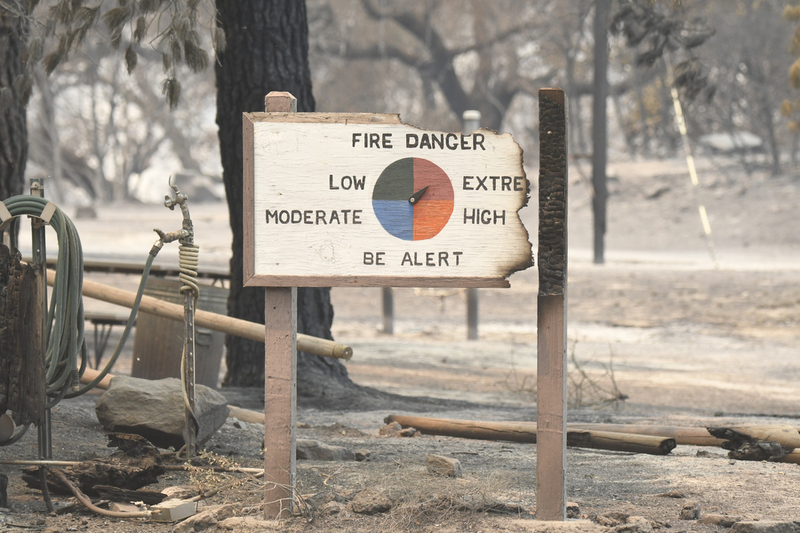 A fire danger sign at Rancho Alegre after the Whittier Fire burned through the foothills above Lake Cachuma on on Sunday, July 9, 2017. 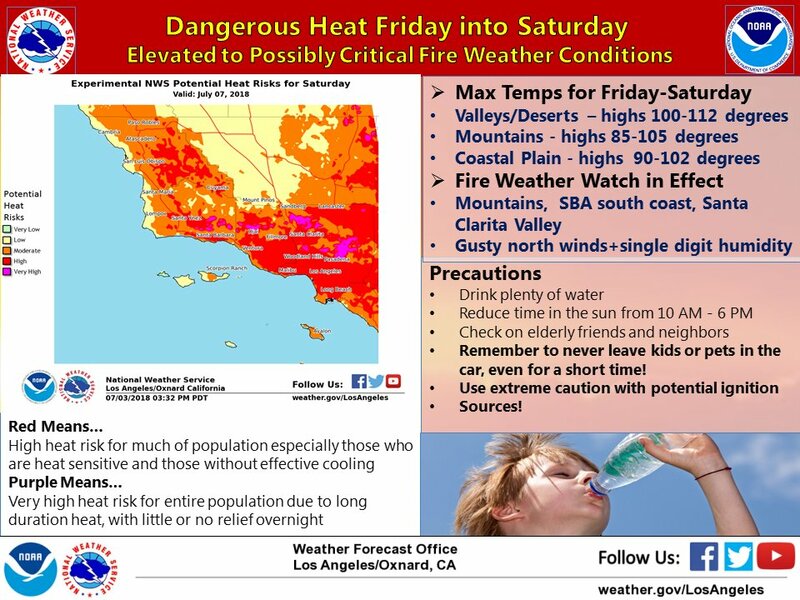 With high pressure setting in over much of the West Coast, National Weather Service officials in Los Angeles and Oxnard have issued a Fire Weather Watch, going into effect on Friday afternoon through Saturday afternoon. Forecasters are concerned that gusty northern winds paired with high temperatures and very low relative humidity will create dangerous fire weather conditions. Just ahead of a big weekend for recreation nationwide, Los Padres National Forest officials are similarly concerned, having raised fire restrictions throughout the national forest. No campfires, target shooting, smoking, or driving offroad will be permitted under the restrictions, and local forest officials are asking that motorists keep an eye out for unsecured chains hanging from vehicles, particularly those towing a load. Roadside fires have been on the rise in San Luis Obispo and Santa Barbara counties in recent years. The Santa Barbara County Fire Department just dealt with a series of spot fires that broke out along Highway 154 just last Friday where a dangling chain is suspected to have sparked the fires. On Friday and Saturday, daytime highs across the lower elevations ranging from 95 to 105 degrees are expected to meet minimum humidities as low as 5 to 10 percent. Overnight, humidity recovery will be “very poor”, indicating a break in the weeks-long “June Gloom” weather pattern that has been the norm across the South Coast. Mountain winds will be strongest in the Santa Ynez Range, particularly near Montecito Hills, where winds out of the north are expected to sustain between 20 and 30 miles per hour, with gusts reaching 45 miles per hour. South Coast communities can expect less severe winds between 15 to 25 miles per hour with gusts reaching 40 miles per hour, with the strongest winds blowing down foothill canyons, especially across Montecito. The weather predictions come during a week that saw a sudden jump in fire activity across the state. Namely, the County Fire in Northern California erupted on Saturday afternoon, burning at a rate of 1,000 acres per hour, at recent count having consumed over 70,000 acres in just a few days. A similarly hot, dry, and windy weather pattern has set up over that region as well. Should dangerous fire conditions manifest, the National Weather Service may declare a Red Flag Warning, which would indicate greater urgency and imminence of poor conditions.